Standing forlorn and dilapidated on Parramatta Road is a Milk Bar owned by the old and reclusive Jimmy Panagakos. It is a remnant of a different time, a place of urban myth and mystery, a stumbling block for George, an entrepreneur and aspiring developer obsessed with revitalising the entire strip. It is a hiding place for Ella, his daughter, who seeks a different world from the one she has grown up in. But there’s something strange going on between Jimmy and his Milk Bar that Ella can’t quite explain to anyone. Not to her father George who only sees a failing business, nor to her Aunty Fi who harbours her own secrets about Jimmy. As George’s fixation on destroying the Milk Bar intensifies, Jimmy must decide whether to hold onto the past and an uncanny love, while Ella tries to find her place in the world, and Fi must finally reconcile her feelings for Jimmy. 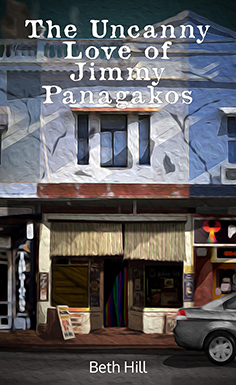 The Uncanny Love of Jimmy Panagakos is a story of unrequited love, longing, and finding our place in the world, which explores dark desires and those hidden places of the human heart.